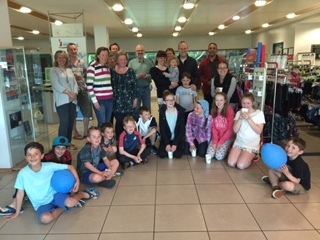 On Saturday May 7, Skin Care Cymru hosted a private swim event for people with skin conditions and their families at the Wales National Pool in Swansea. The event which was widely publicised and was open to all, is part of a wider campaign to support people with skin conditions to feel comfortable in their own skin. Attendees travelled from as far west as Cardigan and from as far east as Cardiff to support the event and feedback was positive with one participant commenting: “We all had a great time swimming as a family. A very rare event.” Another swimmer, who has psoriasis, said that the event “was probably the best perk she’s ever had of having psoriasis!”. Jeremy Cole, General Manager at Wales National Pool Swansea, said the pool was proud to be hosting the Comfortable in My Skin event. He said: “Wales National Pool Swansea is a flagship swimming venue for Swansea and for Wales. We might be best known for being home to elite athletes but we’re extremely proud of our track record in supporting organisations like Skin Care Cymru to encourage people who might not otherwise feel swimming is for them to take the plunge and join in. To find out more about similar events and campaigns hosted by Skin Care Cymru go to www.skincarecymru.org or follow Skin Care Cymru on twitter @SkincareCymru. Previous: Previous post: Do you have a RARE Skin Condition?